During the morning, I worked on the trees in the background of the Mathematical Bridge and then J and I took a stroll along the shore before returning for some lunch. By this time, the weather turned decidedly wet and we were glad to be sheltering in the hut while a line of wet bedraggled people files off the beach. Soon the sun returned and we walked again before going into town for tea and cake. The skies darkened again and we drove through heavy rain to Walsingham where I bought fifteen frames for my Open Studio event next month, before returning home. And now.... lunch and then back to work. 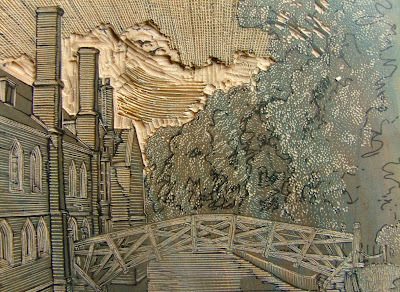 I have spent the last couple of days working on my new engraving of the "Mathematical" bridge which crossed the River Cam at Queens' College, Cambridge. At this point - disaster! I stopped work for a moment and the block slipped of the sandbag and fell to the floor. It missed the mat and landed facedown on the rough concrete floor. I picked it up and checked for damage. It could have been a lot worse but there was still a small but deep depression punched into the surface. I could have engraved over this in a light area but it was one of the darker parts of the water and so I needed to deal with it. The traditional method os to try to swell the wood so that the block is more or less flat again. This is done by putting a drop of water over the hole and using a match to warm and evaporate this so thast the wood swell - obviously being careful not to scorch the block - or set fire to it! I have finished most of the immediate jobs in hand and so I can work on a project for myself. 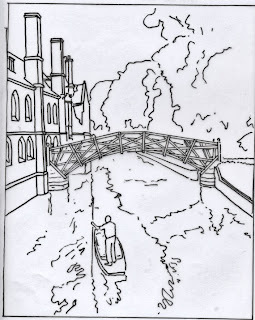 I promised some more details about my participation in the Cambridge Open Studios next month. Instead of working in my own studio, I will be demonstrating and selling engravings in the Gallery@12A in Fulbourn, just to the south of Cambridge. I will have about twenty feet to show framed works and a large table to work on and to show bookplates etc. I'm very pleased with the space. Here is my info page, including a map. The scale of my work does allow me to carry on with it almost anywhere. The gallery will be Open from 11am until 6pm all four days. Apart from engraving work in hand, I need to make sure that I have enough stock for these weekends and Art in Action which takes place near Oxford over the third weekend of July. I still need to work on my large Albion and, in particular, cover the tympan. More of that soon. I made a short video for my Albion blog but thought I would also post it here. 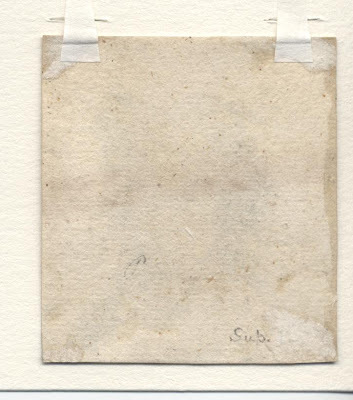 It shows a "printers-eye view" of the process. I am printing a bookplate so everything is on a small scale. I am using several layers of very thin ink on the block. The paper is held in a cut-down clear plastic folder. 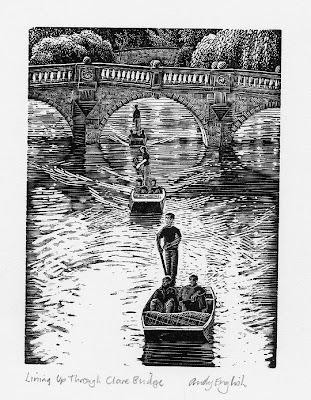 I had just printed 130 engravings - this will yield 100 really good bookplates and some for practice. The others will be rejected. I drove these to Oundle to leave them with Geri Waddington in her wonderful bookshop - well worth a visit. I left with a small packet of bookplates. When I am commissioned to design a bookplate or similar small graphic, I tend to work up three or four small sketches to scan and send to my client. One of these is chosen and I develop it further, making drawings until we are both happy enough for me to start engraving. Blogging tonight - printing tomorrow. Now the paper can be examined easily, I took the print back to the museum for a final examination before framing. The verdict? Not a posthumous printing! 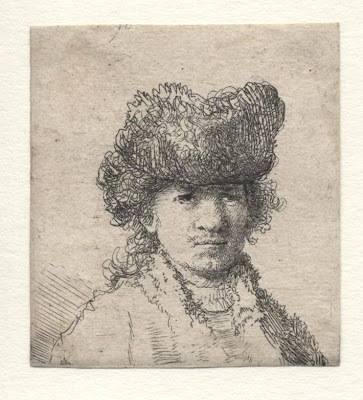 The paper is a fine - probably French - paper used by R from the 1640s. The print is now going back to the conservator to be prepared for framing. I should add that I am always happy to discuss commissions for such work. And next...? A little bit of sketchbook work before making sure that the NA bookplate is ready for proofing.